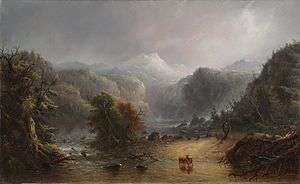 Alfred Jacob Miller (January 2, 1810 – June 26, 1874) was an American painter and sketcher best known for his paintings concerning the northwestern United States. Miller was born in Baltimore, Maryland, where he attended the local schools and hoped to become a painter. He received his first lessons in art from Thomas Sully. After doing some painting in Baltimore and Washington, D.C., in 1833 he went to Europe to perfect his skills, aided by his family. He spent considerable time in Paris but also visited Bologna, Venice and Switzerland. 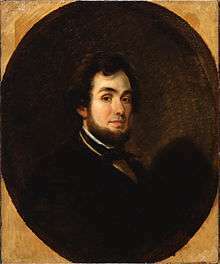 He was admitted without charge as an auditor to the Ecole des Beaux-Arts in Paris and while in Italy he was admitted to the English Life School. During these times, he became friends with the Danish and American sculptors, Bertel Thorwaldsen and Horatio Greenough, respectively, and the painter Horace Vernet. He studied technique, color and line by copying Old Masters in the museums, as was the practice at the time. After returning to Baltimore in 1834, Miller opened a small studio, which was not successful. Seeking a change, he relocated to New Orleans in 1837. There he met the Scottish adventurer William Drummond Stewart, who hired Miller to accompany him and record his hunting journey to the Rocky Mountains. That same year, along with representatives of the American Fur Company, they ventured as far as Fort William and Green River. After returning to New Orleans later that year, Miller started working up his sketches in oils. The scenes and incidents of the hunting journey were the foundation of a series of paintings documenting aboriginal American life. 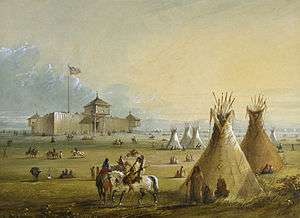 In July 1838 Miller was able to arrange an exhibition in New Orleans. In October 1840 he traveled with his paintings to Stewart's Murthly Castle in Scotland, where a collection of his commissioned work was ultimately hung. After spending a year in Scotland and another in London, Miller returned to Baltimore in April 1842. He established himself as an acknowledged portrait artist in the city. He died on June 26, 1874. Gilman, D. C.; Thurston, H. T.; Colby, F. M., eds. (1905). "Miller, Alfred Jacob". New International Encyclopedia (1st ed.). New York: Dodd, Mead. Wilson, James Grant; Fiske, John, eds. (1900). "Miller, Alfred Jacob". Appletons' Cyclopædia of American Biography. New York: D. Appleton. Wikimedia Commons has media related to Alfred Jacob Miller.